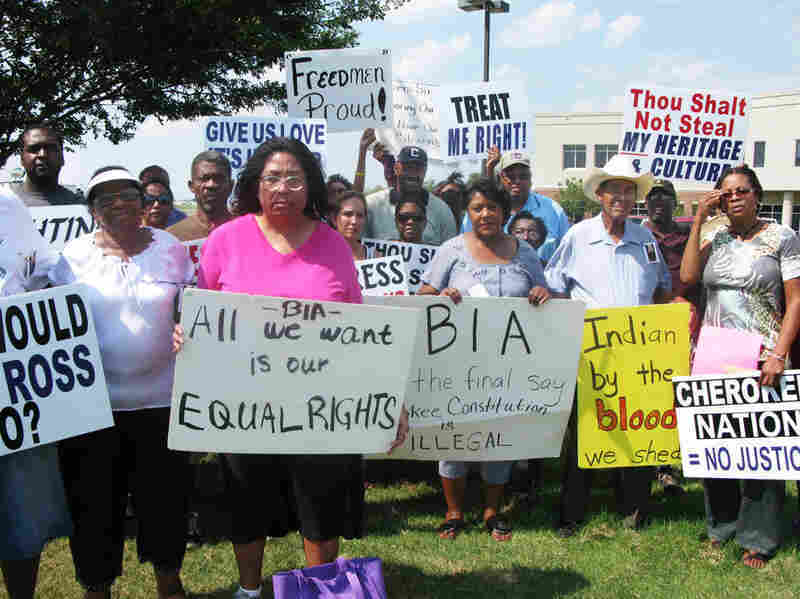 America's 2nd Largest Indian Tribe Expels Blacks The Cherokee Nation recently stripped citizenship from a majority of African-Americans who descended from slaves of wealthy Cherokee Indians before the Civil War. Host Michel Martin discusses this controversial move with MacArthur Fellow Tiya Miles, who studies interrelated histories of African-Americans and Native Americans. The Cherokee Nation recently stripped citizenship from a majority of African-Americans who descended from slaves of wealthy Cherokee Indians before the Civil War. Host Michel Martin discusses this controversial move with MacArthur Fellow Tiya Miles, who studies interrelated histories of African-Americans and Native Americans. Coming up, a major civil rights victory for LGBT servicemembers. The policy which prevented them from serving openly in the military, the so-called "don't ask, don't tell" policy comes to an end today. We'll talk with a decorated Air Force veteran who's career came under a cloud because of "don't ask, don't tell." We'll ask him about his thoughts about this day. But first, we wanted to talk about one of the many complicated stories that involve race and heritage. While it is well-known history that slavery was a common practice in the Deep South before the Civil War, less well known is the fact that it wasn't just white families that were slave owners. Some well-to-do Native Americans also owned slaves. In fact, the late Cherokee Nation Principal Chief Wilma Mankiller wrote in her autobiography that, quote, "The truth is that the practice of slavery will forever cast a shadow on the great Cherokee Nation," unquote. Indeed that shadow continues today in the latest iteration over the debate over just who to include as members of the Cherokee Nation. The Cherokee Supreme Court has stripped some of the slave descendents known as freedmen of their Cherokee citizenship in the decision last month. We wanted to learn more about this story and the interesting intersecting histories of African-Americans and Native Americans, so we've called upon Tiya Miles. She is a professor and chair of the Afro-American and African Studies Department at the University of Michigan. She's also the author of several books on the subject of African-American and Cherokee history, including "The House on Diamond Hill: A Cherokee Plantation Story." And today, it was also announced that Professor Miles is a 2011 MacArthur Fellow. That means she is the recipient of one of those coveted $500,000 Genius Grants. And she's with us now from WUOM in Ann Arbor, Michigan. Professor Miles, congratulations. Welcome to the program. TIYA MILES: Thank you so much, Michel. I'm glad to be here. MARTIN: And I do hope we get a chance to talk a little bit about the MacArthur in a minute. But I did want to talk about this story that's in the news. It's a very complicated history. Could you just set the stage for us about the moment in which these two cultures - African-Americans and the Cherokee Nation - intersected. MILES: Sure. Well, African-Americans - actually, Africans and Native American people first met each other during the colonial era. So, that would have been in the 1500s when Africans were brought to the Americas as both slaves and as indentured servants. That relationship then took a number of twists and turns over time. And one of the most difficult, the 1800s, the 19th century, when some Native Americans in the South began to own blacks as slaves. MARTIN: So, what is this dispute over who is included and who is not included? And why is this - I mean, this would seem to have been something that would have been settled long ago. MILES: Well, I think that we can look at the situation in Native American nations that had owned slaves as being somewhat similar to the United States situation. The U.S. is a country that owns slaves and all the slaves were freed and received citizenship. That is an issue that is hardly settled. They are vested as the legacies of racial division, segregation, racial hierarchy that Americans feel as a whole. And it's similar in Native American nations that have legacies of slave holding. Those tensions still remain. MARTIN: Well, as I understand it, the whole question of eligibility is determined using something called the Dawes Rolls. This is something that arose from the Dawes Commission, which was established in 1893, as I understand it, to convince what we're called the five civilized tribes to agree to dissolve the reservation system and that they wanted a list - the U.S. government wanted a list of all the members and the so-called Dawes Rolls are considered, what, determinative of who is a member of the nation and who is not. But so, what role did the Dawes Rolls play in this current dispute over whether the so-called Cherokee Freedman are members or not? MILES: Well, the Dawes Rolls are central to this dispute. So, in 1887 the Dawes Act was passed. And as you said, that led to an enrollment or development of a census of Native American people. Because before land could be allotted, the U.S. government had to know who to give the lands to. That list was a segregated list. It was a segregated census that divided people based upon their racial ancestry. So, the Dawes Roll was organized by Cherokees by blood and to married wives and also Freedmen. And these lists were incomprehensive to begin with. A number of people who were descended from slaves owned by Cherokees didn't even get to make the list, because they weren't there. They had fled during the Civil War, for example. Other people who had been on previous lists weren't allowed to be on the lists because of the arbitrary way in which designations were made. One example of this, which I think is really telling and also disturbing, is that the Dawes enrollment group that came to make the list would set up tents in the Indian nations. And one tent was called the Indian tent. The other tent was called the darky tent. And there was a second name for the darky tent, which I will not mention on air but I think that you can probably fill in that link. MARTIN: Was it the N word? Did it involve the N word? MILES: And so, when Cherokee people descendants of slaves came to be enrolled, they were directed to one or the other tent. So, the decision was made before they even had access to an interview and got to say who they were. The decision was made whether or not they should be written down on the list as a Cherokee person, quote, "by blood," or as a Freedmen. MARTIN: If you're just joining us, I'm Michel Martin, and this is TELL ME MORE from NPR News. We're speaking with Tiya Miles. She's a professor of history and a 2011 MacArthur Fellow, it's just been announced. We're talking about the Cherokee Freedmen. They're descendants of slaves which were owned by members of the Cherokee Nation. That tribe's Supreme Court has recently revoked the citizenship of the descendants of Freedmen. So, this latest chapter in this historical saga for now some 2,800 Freedmen have been stripped of their Cherokee citizenship, which means that they're no longer eligible to receive, you know, whatever tribal benefits they had been receiving and that their votes won't be counted in an upcoming tribal election. In response to that, the Bureau of Indian Affairs has frozen some payments to the Cherokee Nation until this matter is resolved. Why is this coming up now? MILES: I think there could be a few reasons, and this is speculation on my part because I'm not in the Cherokee Nation. I'm not a member of that tribe. But I think that history suggests that when resources are at stake, there tends to be greater tension around the relationship between enrolled Cherokee people who define themselves as being Cherokee, quote, "by blood," and the descendants of freed people. MARTIN: You can imagine that this has gotten a lot of attention. It's highly controversial. It's heavily covered, as you might imagine, in the Indian media. And there are those who are saying that this is just racist. I mean, that this is an attempt to define nationhood by blood brings up all kinds of nasty historical analogies. And there are a lot of people who are just shocked by that. Should they be? MILES: Well, I think so. I'm shocked. And I think that it's frustrating. It's ironic. It's so difficult to confront the fact that this whole tangle around who should be Cherokee was really set in motion by the United States government, which had colonized Cherokee people and other indigenous people in this nation. So, what the Cherokee Nation is doing now is relying on these Dawes Rolls which were forced upon them by the U.S. government. MARTIN: OK, but that was in the 19th century. MARTIN: We got a lot of racial practices that occurred in the 19th century and before that people no longer embrace. MILES: Well, I think that those legacies remain with us. And I think that in the case of the Cherokee Nation and other native nations, there's a felt conflict between the sovereignty of those nations and the question of what the role should be, what the place should be of minorities in those nations. So, whereas the United States can and has at times protected the status of minorities and not felt itself threatened by Canada, for instance, about what it does. Native nations definitely feel themselves threatened by the United States government. They are concerned that their sovereignty, the right to make decisions for themselves, is going to be undermined by the U.S. government as it has been so many times in the past. But what I feel is a real problem here is that the Cherokee Nation is taking its definition from what really has been a white supremacist U.S. nation that fought to - I'm sorry. Go ahead, Michel. MARTIN: Go ahead. I was just going to ask you how you got interested in this. MILES: I got interested in this back in graduate school. And there were a few different experiences that led to my focus on it. One is that I come from an African-American family that has had an oral history of Native American ancestry and my grandmother, when she talked about it, didn't have facts and names. She just had the story that kind of took on the shape of a myth in our family. It so happened that I ended up marrying into a Native American family myself, and then I had a whole other set of experiences around black and Native American relationships. And then when I went to graduate school and I was taking a course in Native American history and I was quite surprised to discover that, in fact, there had been quite a lot of conflict, tension, pain between Native Americans and African-Americans. So I wanted to explore that. And I really set out to kind of prove my grandmother's story right. And I wanted to find examples of African-American and Native American resistance to racism in colonialism in the United States. MARTIN: But what you found was the opposite? MILES: I did. I did. I found the opposite. I found a story that really had to do with the ways in which the pressures of colonialism and slavery came to bear on native people as well as black people, and sometimes led them to make really awful choices. MARTIN: So before we let you go, we always have to ask. Where were you and what were you doing when you got the call? For people who are unaware of the MacArthur so-called Genius Grants are not things you can apply for. You have to be nominated. People generally don't find out that they've won until they get the call. So, what were you doing when you got the call? MILES: I was at home cleaning the kitchen when I got the call. And this was something that was so completely out of the blue and so completely overwhelming that I actually had to just sit down. I was on the staircase in our house. I had to sit on the steps just to kind of get my bearings and to let this sink in. MARTIN: Any idea what you'll do with the grant? MILES: Well, I've never actually contemplated so much money, but I do have a couple of ideas. One thing that I'm really excited about is continuing my research and taking it into other areas within the U.S. and Native American history. So, I've worked so far on the South and Indian territory. But now, I want to really look at slavery in the north and in particular in Detroit and in Michigan, because this is a place where we also don't really think about slavery existing, but it did. And the slaves in Detroit and in Michigan and Ontario were African-American and also Native American. MARTIN: Well, I hope you'll get a nice bottle of wine, too, in there, maybe. MILES: Maybe. Maybe I'll do that. MARTIN: Tiya Miles is a professor and chair of the Afro-American and African Studies Department at the University of Michigan. And it has just been announced today that she is the winner of a 2011 MacArthur Fellowship, a so-called Genius Grant, and we want to congratulate her for that. Professor Miles, thank you so much for joining us. MILES: Thank you so much, Michel.